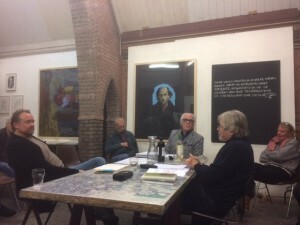 On last Nov. 24 a discussion was held in Rotterdam between Wim Nijenhuis (arch/urban history, writer) and Pieter Lemmens (prof. Philosophy & Ethics Radboud Univ.) about the theory of making in the work of Bernhard Stiegler. Is digital technology a ‘pharmakon’; a medicine and poison at the same time? How to ‘make’ as an technological being? The recorded discussion will soon be on-line…..
Dit bericht werd geplaatst in blog en getagged architecture; virtuality; space door martinpot . Bookmark de permalink .